Is seeing 11:11 a sign that you’re about to meet your Twin Flame? In my experience, the answer is often YES, however I’d like to clarify a few things in this post. There’s so much info on the internet, I’d like to share what I’ve learned from hundreds, if not thousands of people on the 11:11 journey, plus my experience being married to my 11:11 Soulmate, Kris Anderson (also a psychic in Brisbane). This article is an introduction, which I’ll update it over time but hopefully it will get you thinking in a helpful way. *NEW* Watch the replay of our Facebook Live on 11:11, Twin Flames and Soulmates with Conscious Life Events (recorded March 2019). What you see in the mirror (your body) is barely 1% of who you are (think of the tip of a pen vs its body, or even a whole pen factory!) Most of you is a Soul (invisible unless you’re clairvoyant), which is constantly healing and learning for all eternity (see this post on past and between lives regression, where I experienced ‘Heaven’). I used to be terrified of seeing ghosts (hence this post on Caroline Byrd). These days, I smile when people say ‘I’m scared of seeing Spirits ‘ because it’s like being a toe afraid of feet. Seriously, wave at yourself more often in the mirror – surprise, you just saw a ghost, because we are all Spirits in physical vehicles. I guess what we’re actually afraid of, is remembering how powerful and loved we are, because then we truly have to show up. What and Who are my Spirit Guides? When you accept an assignment to incarnate on Earth, your Soul works with higher beings to assign you Spirit Guides for support (a team of helpers, who change over time). You have at least one lifetime Guide and others who help with specific topics (like the Professors at Hogwarts). I recommend talking to your Guides daily (see my Angel Meditation), as they are your best friends and can funnel energy and luck your way, you just need to ask them clearly (e.g. out loud/ in writing). They are voice-activated! Your Guides are ‘the ones’ sending you messages like 11:11, 111, 222, 333, 444 etc. as a way of letting you know you’re on a ‘spiritual fast-track’ right now. Some people see their Guides as ancestors, passed over loved ones, Angels, animals, even coloured lights – there’s no rule for what they look like. In numerology, SPIRIT GUIDE adds to 65/11, the same as ENLIGHTENMENT, while SPIRIT GUIDES adds to 66/12/3, the same as TRANSFORMATION. Working consciously with your Guides like hiring a professional team to build a Pyramid, it’s faster than lugging rocks by yourself…there are no limits once they’re on board. What does 11:11 really mean? Best to see my 11:11 page for this – it’s an awakening code and suite of learning/ Ascension upgrades, that means you’ve asked for a bigger life and want to supersize your impact on the planet. You’re in a 5-9 cycle of rapid evolution and it’s likely you’re at a leap in your numerology (like 1 Personal Year or your lifepath peak age etc.) and have Master Numbers 11/ 22/ 33/ 44 in your chart or around you. 11’s represent the meeting of equals, hence the associate with Soulmates, Twin Flames and meeting our tribe. FYI, Kate Rose’s post on 11:11 and Twin Flames is a worthy read. Once you’re in the process of choosing a lifepath, family, etc., your Soul notifies other Souls that you’re on the move, which can lead to Soul Contracts being formed. These are flexible agreements, outlining what we will teach each other. Many of us have favourite Souls we work with (Soul Families/ Groups), who we may have married/ birthed/ collaborated with numerous times in various dimensions (Earth is just one of many Soul Schools). A Soulmate is someone (often romantic, but not always), who knows why you are here and won’t let you off the hook until you fully express your truth. Not an easy task, but a glorious adventure, and one I enjoy with my husband. Of course, there will be massive fights at times, but then what did you expect? Your Soulmate knows how to push your buttons and vice versa. As humans, we can be pretty thick. Often, pain and arguments force us to stay on purpose, instead of worrying about other people’s business. SOULMATE adds to 25/7 (see the word analysis system), the same as HEART and MORTAL, which suggests we all have Soulmates out there. For more tips, see my posts on Soulmate Myths (plus this followup). What’s a Twin Flame? How are They Different to a Soulmate? It’s a beautiful and ancient idea, that I first came across in the movie Hedwig and the Angry Inch. Here’s a good article by Earth Energy Reader called Twin Souls and the Danger of Looking, which includes this film clip from Hedwig. I will always remember the moment I saw the Souls being separated by lightning…that said, I do think the term gets bandied around confusingly at times, hence this post. The idea is that, while we can have many Soulmates in a lifetime (which I agree with, having met several by the age of 37), we only have one Twin/ Twin Soul/ Twin Flame. They are our ultimate mirrors, which is probably why people report difficulties staying in partnership with their Twins – it’s as intense as living on the Sun! Some authors say our Twin Souls rarely incarnate, however this is changing as Earth goes through massive shifts. They don’t have to be romantic partners however this seems to be a common way they come in. How Will I Know When I Meet My Twin Flame? I can’t tell you for sure, as I’m still collecting ideas but, based on experience and articles like this one by Jennifer Aurelia, I’m sure the signs will be billboard-sized! You can’t escape the perfection. They say, once the student is ready the teacher appears. I say, once the heart, mind and Soul are united, the Twin Flame (and 11’s) appear! Is Kris My Twin Flame? In her post, Jennifer says, “One of the most important signs that you have met your twin is that you have a feeling that this is something very different…There is a special sacredness about your relationship that transcends anything you have ever experienced before. In essence, you already know, you will feel it with your whole being. No other relationship will be as life changing.” This is how I experience Kris, basically my life is divided into B.K. (Before Kris) and A.K (After Kris) in my heart. You could also make that Before Kids and After Kids as they’ve also been totally transforming. I believe that Kris is my Twin Flame, even though he isn’t sure yet (he has a Line of Scepticism in his numerology chart). I mean, we met on live TV, at my second public talk called ‘Five Ways to Read Your Lover by their Hands’, two weeks after he had started his job. We were both in the right place at the right time (see the video). That’s got to be a Divine setup. I even said to him, as I read his palms on camera, that his life was about to take off (I just didn’t realise I was one of the reasons). We read each other’s minds, both do psychic readings, like the same foods, nature, the list goes on. The one exception is I like chant music while he loves heavy metal, as do our babies (!) Oh well, you can’t win them all. When I asked my Tarot Deck if Kris was my Twin Flame tonight, it gave me an Ace of Swords, then a 6 of Wands. Both are Yes cards in my terminology, but even then, perhaps we’ll never be 100% sure due to our Composite Whorl Starseed fingerprints! Ah, the joys of being human. Unlike my other partners, I threw out all my love letters, did the Landmark Forum, went celibate, started The Numbers Queen facebook page, wrote a wishlist and got my house ready before Kris turned up (within 3 days of his ‘due date’). I even bought a brown towel for him (his favourite colour), knowing he’d like it. The magic goes back before then. After quitting my role at the UN, I moved from Thailand to Brisbane on a hunch in 2006, ‘knowing’ I would find my husband. I got a job over the phone and arrived knowing only one person – yikes! Looking back, not only did I dream about living in Queensland as a girl (after coming up for Expo ’88), I always knew Kris existed. I used to think about him brushing his teeth or eating pizza when I was 10 and stared at the night sky. See my post on the secrets behind writing a wishlist My hunches were confirmed in India, where a palmreader said I had to marry the ‘man with a moon face’ (!) See my 10 Things You Didn’t Know About Kris post We have certainly had rough times (see this post about the vision board that helped us stay together), so I know that being with your Twin Flame takes all your stamina and more. Why is it OK to relax if you see 11:11 and haven’t had someone special turn up? 1) I believe that if you’re meant to connect to a Soulmate or Twin Flame, they will come to you as soon as you are energetically ready. While it helps if you’re not hiding in a broom cupboard with a security system installed, there is a Higher Order at work, which knows where everyone’s going. It’s the same force which rises the sun, waves the ocean, shapes mountains and births new worlds – whether you call it God (aka Good. Orderly. Direction, thanks Julia Cameron), Good, Karma, Fate, Consciousness, Source…it’s smarter than us, that’s for sure. If humans were in charge of making it rain we’d run out of water by next Thursday! For a reality check, take out a calculator, and figure out how many days you have been alive (multiple your age by 365.25 days). I’ve been here 13, 788 days and so far, there’s always been air to breathe, land to sleep on and water to drink. For that I am grateful. 2) You could be in a can-opener relationship, which is important preparation you don’t want to skip. These people, jobs, situations etc. are often the one before the one (or the one before the one before the one…) See my post on can-openers. Even short, toxic encounters can teach us more about love than we’d learn in a century of happiness. Hence the Spike Milligan quote, ‘blessed are the cracked, for they let the light in’. The 11:11 spiral of learning, is more like a high ropes course that you do blindfolded, than a walk in the park with cupcakes. It will take you past what you thought was real (see Steve Pavlina’s epic 11:11 post), into a galaxy of rabbit holes, and introduce you to communities of beings (real and invisible) who cause daily miracles. See my post on the 4 Stages of 11:11 Awakening for more. Yes, you’re likely to fall in love along the way. It’s also true that one day, all of us will be bones. So enjoy what’s in front of you folks, it’s what you asked for not so long ago. Seeing 11:11 can be a positive turning point in consciousness, when you get educated, and surround yourself with tribe. Please, be careful not to judge yourself or others, for being, or not being in a relationship during this time. Your choices are unique and perfect. Sometimes we’ve been married 50 years in one lifetime, so we need to have fun in this one. Conversely, we might have been a monk for and are here for a very special marriage this rodeo. Pet peeve – I cringe when I hear about people being dumped because they’re not someone’s ‘Twin Flame’ or ‘evolved enough’. Take responsibility for ending a relationship, instead of indulging in spiritual whitewashing. Remember, we all swap roles/ genders etc. and it takes a lot of love for someone to be your worst enemy (e.g. see Little Soul and the Sun by Neale Donald Walsch). As I’ve learned from reading A Course in Miracles, there’s always a flip-side we’re yet to see. Here’s an fascinating, external post about Twin Flame Conflict: Why Do I Have to Do All The Work I learned a lot from reading this! 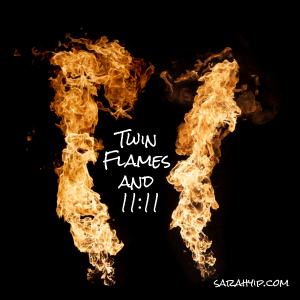 I hope you’ve enjoyed this article on 11:11 and Twin Flames. What qualifies me to speak on 11:11? I guess you’d call me an expert researcher (or just a massive numbers nerd!) Since my awakening on 11.11.11 (the day of my biggest breakup ever), I’ve devoted several years to doing 1-on-1 interviews (in the form of numerology readings) for people, especially those who see repeating numbers. We’re talking cathartic 1-2 hour sessions, working through lifepaths (find your lifepath here), historical and upcoming events, and Soul contracts. That’s trippy considering my previous work as scientist and fundraiser, but then, many 11:11 See’rs are ‘flippers’ who move from traditional to unconventional occupations in order to serve the planet. We’ve come to build a bridges (11 even looks like a pathway from Heaven to Earth). I’m sitting in front of a stack of thousands of their charts as I type this. No computer reports here, I research and hand write each person’s Soul Contract (looking for Master Numbers 11/ 22/ 33/ 44 and other signs of 11:11 energy) before working with them, which makes this a 24/7 calling. Unless you’ve had a session with me or been a psychic, it’s hard to explain the level of energy required to do this continuously (especially with two kids under two). Imagine sitting for your driving test, or going for a job interview or first date, multiple times a week. It takes nerves of steel. That’s why I meditate every day, eat like a horse, and barely drink or party, because I need to stay clear. In that way, I’m like an athlete or performer – always ready for the next race or show. Pretty typical of someone with an 11 lifepath, we love double the action! 6 Myths About Soulmates, Busted!